"Have you heard of a place called Bistro Miyoda Noodle House?" These were the words written by a friend of mine while gchat-ing the other day. In which I responded, "no I haven't! let's go!" Apparently, the owner of Bistro Miyoda & Sushi Ichiriki in Redondo Beach has expanded into the world of ramen. With a handful of noodles and several fusion-ish appetizers & entrees on the menu, BiMiNoHo is looking to compete within the heavily saturated ramen mecca of Gardena/Torrance. One advantage...homemade noodles! Tan-tan Noodles: "Our signature dish! Spicy sesame noodle soup with a hint of vinegar." Hint? Let's just say the vinegar stood out. Aside from that, this Tan Tan Men was curiously interesting. It had a great nutty flavor mixed in with a mildly spicy afterthought that flared authenticity. With so many ingredients floating around and settling at the bottom, drinking the soup felt like drinking OJ with pulp. It may not be the greatest, but for Tan Tan Men in LA it has promise. The homemade noodles taste more like thin udon noodles (which I thought was great) and complement the soup very well. If anything, I would have liked it to be more spicy. Cha-Syu Noodle Soup: Umm...the chashu was very moist and tender, but the soup was disappointingly boring. It tasted closer to a broth that would be used for udon or soba than for ramen. It wasn't necessarily bland...it was just bleh. And the menma was meh. The homemade noodles were still impressive, but they deserve a better home. 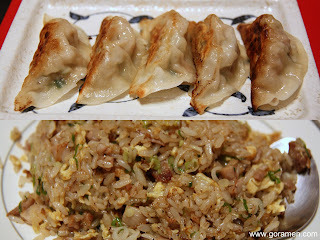 Gyoza & Chahan: The homemade gyoza were very fresh but lacking in flavor. They just needed something more to give it that punch. Perhaps a little more garlic. The chahan, on the other hand, had plenty of flavor and I enjoyed it the most. Here's a little tip: Order the combos (#21-#26) if you want to try them with your ramen. You'll save a couple bucks. BiMiNoHo is located in the space that Daruma Izakaya used to occupy on the west side of Western Ave just south of Redondo Beach Blvd.